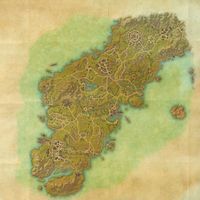 Glenumbra, the westernmost region of High Rock, contains the city-states of Daggerfall and Camlorn, the great cemetery of Cath Bedraud, and the wild areas of Hag Fen, Glenumbra Moors, and the forests of Daenia. Glenumbra is a region in High Rock covering the entire peninsula that separates Iliac Bay from the Eltheric Ocean. The peninsula's geography is a mix of rugged woodland and fetid swamps. Local creatures include the snag-weevil, of which there has recently been a plague, and werewolves, which are particularly prevalent. The forested region of Daenia lies at the southern end of Glenumbra, and it is here that the witches of Beldama Wyrd make their home. 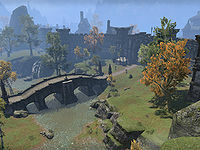 King Casimir rules Glenumbra from the coastal city of Daggerfall, and the Knights of the Dragon are based in the city. The climate is temperate, with the weather primarily comprising of sunshine and showers. North of the forests lie the Cambray Hills, a perpetually foggy region of marshes and fens. The city of Camlorn sits on the highlands to the north, and there have been increasing reports of werewolf activity in the area. King's Guard is the northeastern region of Glenumbra, and like the Cambray Hills, is shrouded in a perpetual mist. King's Guard is home to the great cemetery of Cath Bedraud, the final resting place of the Breton nobility, where the Lion Guard have been investigating reports of Bloodthorn Cult activity. In the east of the region is the small town of Crosswych, which has become a hive of activity for the Red Rook Bandits. Just beyond the town is the hillside trail to Stormhaven. Abandoned Cellar — A Worm Cult base located beneath Vulkhel Guard, Daggerfall and Davon's Watch. 5 items: When you take damage, you generate 5 Ultimate. This effect can occur once every 5 seconds. 5 items: When you cast a Magicka ability, you remove up to 5 negative effects from yourself. This effect can occur once every 15 seconds.